The pilot program will launch with 11 teams to start. 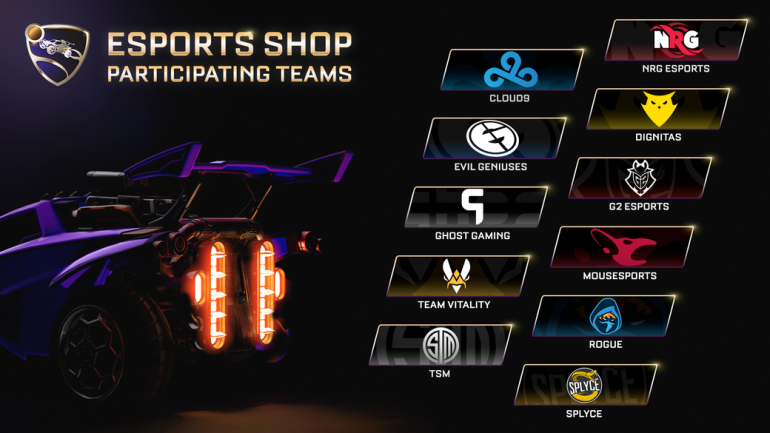 The launch of Rocket League’s esports store is fast approaching with Psyonix confirming that the store will open its doors on April 16. The store will offer a host of in-game items based around various esports teams playing in the RLCS for players to put on their Rocket League cars, and Psyonix has officially unveiled which teams will be part of the initial pilot program. There are 11 teams in total, which includes Cloud9, Evil Geniuses, Ghost Gaming, Team Vitality, TSM, NRG, Dignitas, G2, Mousesports, Rogue, and Splyce. Each team will have two decal items, one Player Banner per team, and a variety of esports-themed wheels to pick from. The new store will appear in the Main Menu under the “Shop” tab and will feature six in-game items each day. It’s a weird approach, as it means fans will need to log on daily in hopes of their favorite esports teams item being one of the items on sale. Items are also not tradeable. Exact prices for each item has not been announced at this time, but it is a weird approach to take. Other esports stores on similar games like Overwatch and PUBG have just sold all the items at once, giving fans the freedom to get whatever they preferred.